We have been trying to find a non-dairy Protein powder for our family. It has been a challenge to find a protein powder that is non-dairy and tastes great. “Boomer Nutrition Organic Vegan Protein” is a good choice for our family. We had to experiment a bit with the “Boomer Nutrition Organic Vegan Protein” to get it “just right” for us. My son eats smoothies every day and is very aware of texture in the foods he eats, so we need something that not only tastes great, but is acceptable to his quirks. Initially we used a full scoop of protein powder in almond milk and found that it had a bitter taste and was extremely thick. Much to thick for us. We could have added more almond milk but knew that if we did we would never be able to drink it all. So that experiment was a fail. The second time we used half “Boomer Nutrition Organic Vegan Protein” and half of our unflavoured vegan protein that we normally use in a banana and berry smoothie.This worked out perfectly for us. Between the added sweetness of the fruit in the smoothie and the fact that we used half the amount of chocolate protein the result was a great tasting smoothie. The third experiment was to try a full scoop of the “Boomer Nutrition Organic Vegan Protein” in a banana and berry smoothie. This was just “okay” but the chocolate flavour was still a bit too bitter and my husband and son prefers the ” half and half”. Half “Boomer Nutrition Organic Vegan Protein” and half unflavoured vegan protein is perfect. 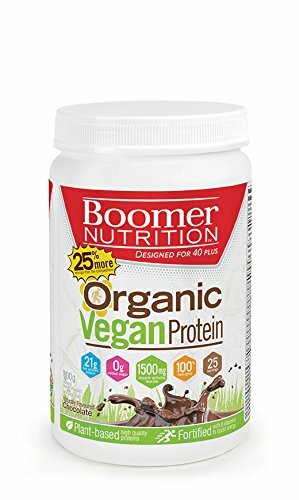 *Disclosure: I received a complimentary “Boomer Nutrition Organic Vegan Protein” through the Amazon Vine program in exchange for my review. All opinions are 100% my own.